Welcome to my latest dividend income update for 2019 folks – happy to have you on the site. To recap, we take a hybrid-approach to investing. These posts are only a portion of those updates. Approach #1 – we own a number of Canadian dividend paying stocks for income and growth. We hold these stocks inside our non-registered account and within our Tax Free Savings Accounts (TFSAs). These updates are all about that! 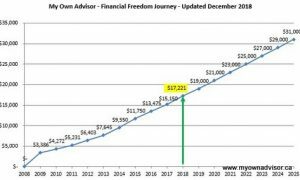 These monthly updates focus on our Canadian stock portfolio and my big hairy audacious goal to earn about $30,000 per year from the income delivered by these stocks held inside our non-registered account and TFSAs. We figure that should be “enough” beyond other assets for semi-retirement. In recent weeks, I’ve received a number of emails about our investing approach, what stocks in particular we own and how our portfolio compares to a Canadian ETF or index benchmark. All great questions! So, let’s answer them as part of this dividend income update. I know you keep saying you disclose a lot on your site, and you do(! ), but I’ve often wondered what exactly you own in what accounts. Can you shed any light on that for your readers? Sure, a bit. First of all, thanks for respecting the fact that I don’t and won’t ever share every detail on this site. Some things, financial or otherwise, are private and personal. Second, I do disclose many of my holdings. You can find them there. Third, if you want more details, then you should be aware I hold mostly financials in my non-registered account and a mix of Canadian bank stocks, pipeline stocks, utility stocks and Canadian Real Estate Investment Trusts (REITs) in our TFSAs. Our portfolio is very simple – I’ve largely unbundled the top-20 holdings of this big ETF for income. “I also do not believe in buying companies that do not pay attractive dividends. Nobody can forecast the future. But it’s obvious that companies that have a strong uninterrupted record are more interesting than those that have not.” – Stephen Jarislowsky, The Investment Zoo. Also, instead of paying money management fees close to 0.60% to own the REIT ETF XRE or even 0.39% to own Vanguard’s REIT ETF VRE, I’ve decided to unbundle my Canadian REITs as well. At the time of this post we own about 8 different Canadian REITs directly. You do know that one dollar of dividends is equivalent to one dollar in capital, right? Money is money? Meaning, is there a reason why you’re not yet ready to accept indexed ETFs as the best way to invest – given you should ideally be indifferent between the two – dividends and capital? A stock like BCE that pays 6% dividend yield and doesn’t really increase in price (of late!) provides the same return as a stock that doesn’t pay any dividend but that stock price increases by 6% – see what I mean? Reader, you’re right. But on a more psychological front, I like seeing that cash flow and I stay motivated from it over time – so much so that I don’t trade or sell my stocks very often. That includes when the prices tank. Will I own more indexed or low-cost ETF units as I get older? Possibly. I mean, I’m buying more units of VYM every year in fact. But for now, on the Canadian-side, my journey is what it is! You can find some of my favourite low-cost U.S. ETFs here. I’m curious if you report your benchmarked results anywhere? Thanks! You bet, although I don’t micro-manage my portfolio. I shared some benchmarking information in a previous post here. In 2018, my Canadian stock portfolio was downright miserable – but I held on. Over the last 12 months I’m up almost 14%. My 5-year returns are around 8%. Since I started tracking my Canadian stock portfolio, approaching 9 years later this year, annualized returns are just over 8%. For comparison purposes, since I mentioned I own a number of stocks in the low-cost ETF XIU, I use XIU as my Canadian benchmark. 5-year returns for XIU at the time of this post are 6.2%. 10-year returns for XIU are close to 10%. It will be interesting to see in a couple of years if I’m ahead or slightly trailing XIU as my benchmark. Thanks to dividends paid and mostly reinvested every month and quarter, our dividend income is growing. At the end of February 2019, we’re on pace to earn $18,400 this calendar year in dividend income. For diligent readers following along, that’s over $2,300 more than this time last year. 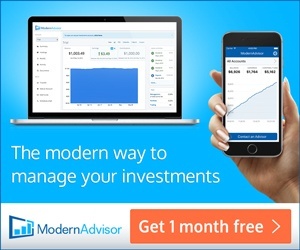 I predict if we keep up our very boring ways in another 5-10 years, we’ll realize our HUGE goal of earning $30,000 per year from our non-registered investments and investments inside our tax-free accounts. That will be extremely good since if we’re debt-fee by then we’ll surpass our crossover point. Our choices about working or at least working part-time will be wide open. Dividends are never guaranteed. There are risks with my approach. This approach is not for everyone but I’m optimistic our income should grow next month. Stay tuned to find out and thanks for reading. 49 Responses to "February 2019 Dividend Income Update"
Great update Mark! Dividend growth investors should not be shy about the magic of dividend growth investing, both on the behavior and the math. Core large cap investing is great as well. Always to each his or her own. Keep on inspiring, and showing the way. Thanks very much Dale. Onwards and upwards with the CDN content and trying to own more U.S. assets to get away from my home bias over time in my RRSP. Love comments like this. Certainly they are the same if one sells capital when the price is up 6%. For those who prefer not to sell and still receive income, than they are not the same. The dividend (from quality companies) is received whether the price is up or down and more likely will increase. Price is a fickle item to rely upon. I think that is where they are coming from – one dollar of dividend is the same as one dollar in capital. The beauty of dividends, for me, is the notion of getting paid regardless of the price. The problem with this theory is if both stocks drop you have the dividend! Well, I do know, for a fact – whether someone earns $1 in dividends or $1 in growth alone – it’s the same $1 🙂 It really doesn’t matter. It’s just math. That said, I love seeing the cash flow in and it helps me to stick to my plan regardless of what the stocks are doing in price. Also, I don’t see the huge advantage of owning the Canadian ETFs when most of the cap-weighted ETFs essentially own the same top-20 or top-30 companies and charge a fee for that. This *theory* also does not take into account transaction costs to get the funds. Dividends usually come out quarterly, or monthly in some cases, and costs me nothing, zip, nada, zilch to receive. If I had to sell stocks to get that same amount of money, theoretically in a well diversified portfolio, I’d have to sell several holdings to retain balance, diversification, etc. Yes, a single ETF would obviously likely require less transactions but the premise that 6% dividend is equal to a 6% capital gain may not always be correct in the larger picture. Furthermore, some may prefer to have the relative certainty of the amount to be received for budgeting purposes that a stable dividend investment can provide. Sure they can access the same amount of money by selling more stock, but they will not know in advance how much depletion of principle will be required to do so. Some may not care, it’s up to them and their personal situation. My friend who is an indexing investor, always laughing at me being mental accounting for the exact reason. I think investing really is a mental game. Do I want to watch the market closely to decide when I should sell my holdings in my retirement time. Nope. Especially not in a market down year. But I am aware my portfolio of dividend growth portfolio might have a lower total return comparing to an indexed portfolio in the long run. I think stability and peace of mind is more important when I retire. I am willing to accept a lower total return as long as I have enough investment income to live on. May:”But I am aware my portfolio of dividend growth portfolio might have a lower total return comparing to an indexed portfolio in the long run”. If you stuck with quality DG stocks you will do much better than Indexers in the long term!! Thanks, cannew. Quality dividend growth stocks are my current plan. I know from you and a few other’s experience, historically it is and I definitely hope that will be the case for the future too. I’m not sure that statement is true cannew – re: it really depends on what dividend stocks one might buy and hold but there is absolutely a potential for that long-term. Many dividend investors hope so! “I think stability and peace of mind is more important when I retire.” – exactly my mindset now as I build the portfolio and keeping my existing CDN stocks but also building my portfolio via U.S. ETFs is the game plan! Another thing: if my dividend stock prices go up: Great! Higher total return/portfolio value! If my dividend stock prices go down: Great! My DRIPs are more effective and being in my accumulation phase, I get more bang for my newly invested dollars! In this approach, it’s a win-win! Love my DRIPs as well but that’s also like investing in a stock that pays no dividend since you are always reinvesting the money paid: dividends + capital gains = total return. Great update Mark. I love seeing dividends coming into my account regularly and I get paid to ignore the price. Also love getting those dividend raises. Slow and steady. Congrats on breaking $18 000! Thanks for the congrats – I think $18k is a huge new milestone for us and I’m confident if the companies we own keep paying and increasing their dividends this year and next year then $20k per year is coming soon! Thanks for the update Mark. Dividend paying companies also increase in value…paying you twice! I think you have to do a lot more homework when buying companies that don’t. But buying some that don’t pay dividends may help your diversification, and maybe buying ETFs may help with that. Well, dividends are part of total return but yes, I see what you mean…you can get 4% dividend + 3% capital growth over time, for an example, which is the same as a stock that returns 7% growth. I will be owning more ETFs (U.S. ETFs) as I get older for sure. Nice update and 18K+ progress Mark. My preferences on equity side of portfolio is to have Canadian dividend payers, and ETF indexing with a dividend tilt for US and international. Like May I accept there could be less capital growth from the dividend payers and a lower return from the FI part of portfolio but our chosen asst allocation and investment choices provide a solid income base, along with some of the other benefits mentioned above. No magic but just a high “sleep good at night” formula for us. However total return is important to us as it will ultimately continue to drive our potential lifestyle in retirement. Ya, I can see my approach owning more U.S. ETFs units this year – currently saving up cash inside my RRSP for that particular purpose. Maybe by May I’ll be able to make a transaction. Good luck with your savings. It will be interesting to see what happens with the CDN/US $$ in the coming year. I will most definitely have more US etf holdings in the future, but I can’t really say when at this point. Wow, very impressive Steve. $100k per year in dividends would be very, very impressive. Keep it up and keep us posted. As it’s tax time and I’m gathering all the T3’s, T5’s, etc…. I’m wondering how the T5 dividend reports ($8000 approx) in my taxable account will impact my income tax refund/payment. Likely payment. With a 2018 employment income of approx $86K, and now retired for 2019 with an approx retirement pension income of $44K, is there anyway I can defer paying taxes on 2018 dividends until 2019 when my income is lower and I’m in a lower tax bracket? I’m not aware of any taxable income deferral method on dividends earned – but I’m not a tax pro either. Meaning, tax on dividend income must be paid in the year it was earned. I know for me, I make a few bucks per year in a taxable account so I’m paying taxes on that dividend income every year – not ideal – but I now know better. Live and learn. A good problem to have I guess as I get older. I find dividend income is favourably taxed at modest to mid-high income levels, say less than $100K per year assuming little other income sources. After that, I recall capital gains are a more favourable form of taxation. Canadian eligible dividends are more favourable than capital gains up to about $93K and are VERY favourable under $47K or so. Taxtips.ca has some great tables on that. Don’t own this one. But I own ADT.B. ADT.B just raised dividend from 0.10 to 0.125. Still nothing really. I am still happy to take it. This is one of my low yield high growth (hopefully) hold. Small position though, only 100 shares. I am assuming you meant ATD.B. I don’t have any of that. Not sure why. I’ve seen articles about it but I guess just never really looked at it. Steve, why don’t you tell us – how you got to where you are? Most in here are trying to get to where you, Cannew and I are at and most posters that give advice haven’t made it or think they have made it – but really haven’t. This is certainly the case in the accumulation phase but it certainly is not in the retirement phase. As some have mentioned, if you need the income to live off, then you always have to be watching the market and selling some of your holdings to actually realize the capital gain. That would be an absolute ton of work and would be highly stressful. Just collecting your dividends in cash is a piece of cake. it’s worked like a charm for me & my wife for the last 6 years of retirement. I believe this is what makes this approach to investing appealing to me….I don’t really watch my portfolio and I don’t really have a desire to sell or trade stocks when they are suffering. Instead, I stick with my plan and own my ~ 30 stocks for income. Hopefully a get wealthy eventually plan Don like you! Mark I’ve been reading your column with interest. Question for you. In retirement my wife and I will be income splitting a $160,000 DB pension. Does a portfolio geared towards dividend generation still make sense? Feasibly we will be able to generate close to $40,000 a year in dividends, but in doing so I believe we will have our OAS clawed back. If we concentrate on growth stocks perhaps we could be more strategic with our withdrawals….or perhaps the relatively small OAS supplement is a moot point? I suspect you’re going to get several points of view on this one Garry. Some folks live to not pay taxes or have their OAS clawed back and will go to great lengths to avoid the taxation scourge. Some do not sweat it so much. Receiving dividends can be problematic in that the actual dividends are also grossed up before the dividend tax credit kicks in thus affecting the clawback even more. So you’d be correct in perhaps seeking capital gains over dividends. Personally, I’m fine with the potential of having my OAS clawed back but I have a personal obligation to Canadians to pay back. This may come down to each individual and their situation. This is hardly the end of the world all things considered. Health is most important! So, that being said, if you want to avoid any tax problems in retirement, you could consider continuing to income-split your $160k DB pension (wow by the way…) and own a portfolio of growth stocks (vs. dividend payers or high-yielders) such that you can optimize capital gains vs. grossed up dividends. Capital gains for wealthy folks are rather tax-efficient. You can also consider drawing down your personal investment assets more quickly – since you have a massive “big bond” pension. All this to say, a life with a tax problem as a retiree I think is a very blessed one. Mark thanks for the sage advice. I will have to re-think my portfolio and investment strategy. Perhaps taking dividends out of my non-registered investment account might be the best way to proceed. Life certainly is good and I thank you and Lloyd for your comments. I know in our asset accumulation years, now; we’re focused on sheltering taxes (use of TFSAs, RRSPs first) vs. non-registered investing. As we get older, I suspect one of our objectives will be to continue to shelter tax as much as possible and make our non-reg. withdrawals as tax efficient as possible. Mark, I really appreciate your site. It is a wealth of information and positive reinforcement of the saving, investing and being patient principles. I would like your advice please. I see that you own shares of BEP-UN. I have free’d up some cash in 3 different accounts. LIRA, TFSA as well as our taxable cash account. Would you pick one account over the others for this investment? I heard an adviser on BNN say that any investment like BEP or RNW-UN should only be held in an RRSP. Thanks for the kind words Angela – love that type of feedback! I can’t speak for your investing risk or selections, but yes, I own BEP.UN but I own the interlisted version in my USD $$ RRSP – BEP. I do this because 1) BEP.UN pays dividends in USD $$ so I might as well own BEP and not have my brokerage convert the USD $$ back to CDN $$ and therefore I lose out on the exchange rate and 2) BEP or BEP.UN pays a mix of dividends, interest, and other. If you held BEP.UN in a taxable account, you’d have more to deal with (mix of dividends, interest, other). I can’t say why the adviser said that but that could be a reason? All told, best to fill up TFSA (tax free) and RRSP (tax deferred) before taxable investing. Are you sure there is a currency conversion charge by your broker to convert US to CDN – BEP & BEP.un? 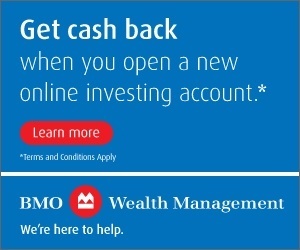 I know I did homework on BIP/BIP.un & BPY/BPY.un on the Brookfield site, reviewed my own holdings (in TFSA), BOC site and called broker and there were no charges or currency leakage. I posted this on 1 or two of your threads somewhere. Searched but couldn’t find. I confirmed conversions are always done at BOC spot rate per Brookfield policy, and there were no charges by broker. However, I don’t know if this applies to BEP or other Brookfield holdings though. I’m not sure about reasons on not holding BEP/un in unregistered. Maybe something about it not being a corporation or a trust, but a partnership that affects tax treatment. Well, I’m not 100% sure there isn’t a brokerage charge by all brokerages but I would expect some brokerages might “ding” investors on that. Maybe your brokerage, as you have confirmed then, converts at the BOC spot rate – which is great 🙂 I’m not convinced all brokerages do that so I just wanted the reader to be aware. I would think the mix of assets BEP holds could affect tax treatment; so be careful with non-registered investing. There are K-1 forms issued by many Brookfield companies and I suspect it can get tricky if you invest in this stock in a non-registered account. I wrote about that actually. Yes, its possible that might vary by broker. However, I recall the BIP/BPY spot rate was also confirmed at TDDI. I’m posting below the BIP policy from their distributions page. Maybe this ties the hands of the brokers to charge differently (I would unhappy as an investor if broker deviated), but I couldn’t find the same information for BEP. The quarterly distributions payable on the Partnership’s LP Units are declared in U.S. dollars. Yes, that’s it- the MLP situation. You’ve covered a lot of ground with your blog! Thanks for sharing the details, as always! Anytime. If someone gets something out of it – all good.